What is another word for inhibited? Having a hesitancy or reluctance to exhibit normal emotional reactions; of people; as, he was too inhibited to make friends easily. hinder, Hindered, impede, impeded, hamper, Prevented, Deterred. prohibited, Interfered, Restraining, initiated, stopped, limit, limited, invalidated, constrain, discouraged, disrupted, Curtailed, stifled, barrier, deactivated, suppressed, undermined, Began, banned, affected, constraint, hurt, withheld, blocked, Dampened, decreased, Forbade, harmed, Denied, pre-empted, reduced, Detracted, Was, governed, Slowed, Froze, Commenced, impacted, Stalled, prejudice, started, barred, Launched, saved, damaged, engaged, jammed, hard-wired, plugged, kept, struck. 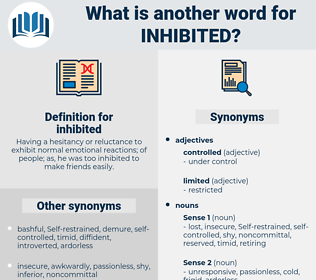 prohibited, stopped, diminished, limited, obstructed, constrained, impaired, Interdicted, Caught, disrupted, circumscribed, Curtailed, frustrated, stifled, Jeopardized, Forestalled, suppressed, thwarted, undermined, embarrassed, halted, Hamstrung, affected, complicated, nullified, curbed, blocked, Precluded, stymied, Dampened, weakened, deprived, sequestered, encumbered, stranded, confined, dented, disqualified, Challenged, Averted, Denied, delayed, Hobbled, shut, blockaded, paralysed, burdened, handicapped, reversed, tied, Slowed, silenced, stunted, Stood, impacted, Stalled, bounded, prejudiced, braked, barred, stalemated, Trumped, locked, deadlocked, occluded, choked, Compromised, jammed, capped, Encountered, Lodged, mired, kept, restrained, restricted. bold, aggressive, self-confident, sociable, immodest, extroverted, forward, outgoing, friendly.